Young people constitute a sizeable portion of the Asian Pacific population and tend to be particularly exposed to bribery and corruption as students, pupils, workers, customers and citizens. But young people can play a pivotal role in the fight against corruption, in Asia Pacific and beyond. While people from the older generation tend to see corruption as an inevitable and acceptable fact of life, young people are more open to wide-scale socio-political transformation and can help change attitudes and build zero-tolerance for graft and bribery. 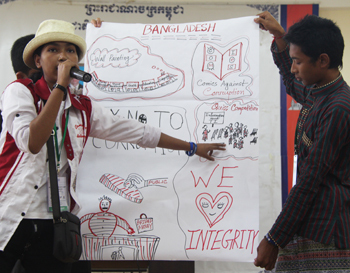 In a Youth Integrity Survey conducted in Asia Pacific last year by Transparency International, almost nine in 10 respondents said they believed youth can play a role in promoting integrity and fighting corruption. 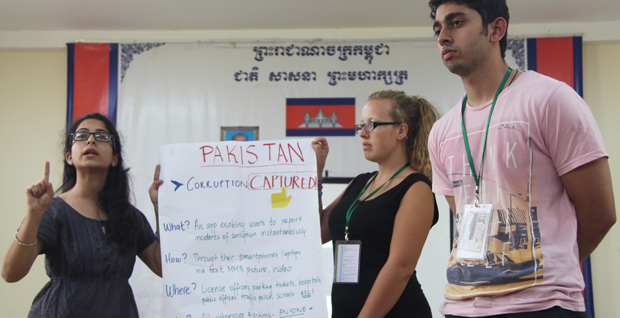 From 4 to 10 January 2015, 33 youths from Bangladesh, Cambodia, Indonesia, Malaysia, Pakistan, Vietnam and the Philippines gathered at the first ever International Youth Camp on Youth Empowerment for Transparency and Integrity (YETI) in Siem Reap, the land of the temples of Angkor, Cambodia, to learn and exchange on the negative impact of corruption in their countries and across the region, and brainstorm how they could combat the scourge together. The event, sponsored by Transparency International and organised by the movement’s seven local chapters, sought to enhance the young participants’ sense of belonging to a community, inspire them to stand up to corruption and equip them with the tools to do so. The corruption fighters in the making were given insights on human rights and rule of law by an expert from the United Nations, learnt the basic principles of the United Nations Convention against Corruption and were given a presentation on good governance, the separation of powers and the importance of access to information by a Cambodian expert. They got the chance to interact with youth activists from across the region (Cambodia, Indonesia and the Philippines), who shared their knowledge and experience on the importance of building a vibrant youth network to promote human rights and fighting corruption. They also learned how to enhance their civic engagement through social media, ICT tools and mobile applications. The young activists were showed how to create an online survey on SurveyMonkey, write an e-newletter on MailChimp, explore the possibilities of crowd-funding and make use of crowd-sourcing tools such as the Bribespot, a bribery-reporting tool where individuals can flag their encounters with corrupt officials anonymously, with the ultimate aim of mapping out corruption hot spots. Students from each country team came up with a concept note, a budget and a grant management plan for a youth-to-youth initiative to be implemented in their country with Transparency International funding. These projects include anti-corruption comics in Indonesia, debate competitions in Malaysia, research and advocacy on corruption in hospitals in Pakistan, awareness raising activities on transparency in recruitment processes in Vietnam, training camps for youth in Bangladesh, anti-corruption campaigning in villages in Cambodia, and outreach activities to incite young people to work with the government and change things from within in the Philippines. Perhaps the main outcome of the week-long camp is the creation of Youth Movement for Transparency in Asia (YMTA), a platform where elected representatives from each country will meet regularly to exchange ideas and carry forward projects to promote transparency and integrity across the region. The secretariat, management team and advisory board of YMTA have been developed and the first joint initiative plan identified. Each of the members signed Transparency International’s Declaration against Corruption to exemplify their commitment to the movement.